Getting married is an exciting life-changing milestone. Before the wedding, it’s common to want to learn as much as you can about your future spouse. You should know their financial situation and goals, but after the wedding and honeymoon is when you start actually putting your plans into action in terms of how you will live together and manage money. 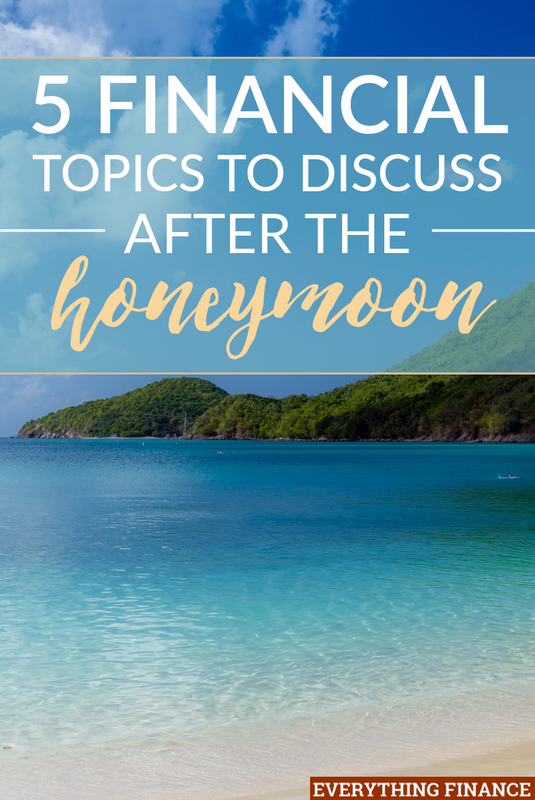 If you are still in a state of newlywed bliss, here are 5 financial topics that you may want to discuss with your partner after your honeymoon. In most relationships, it doesn’t matter who pays the bills as long as they get paid on time. At this time, you should have a good idea whether you’ll be combining finances completely or not, which will give you a better idea of who’s responsibility it will be to pay the monthly bills. If one of you is naturally better at managing money, that person might want to take the reigns. Or, if one of you has a little more free time outside of work, you may be able to take on the added responsibility. My husband and I do a hybrid method where we each assign ourselves specific bills to be in charge of so the responsibility is usually equal. Either way, find what works for you and make sure both of you are on the same page. If you’re going to set up automatic withdrawals, make sure each of you know about it. There’s nothing worse than assuming the other person has a specific responsibility and starting your first month of marriage with late fees or miscommunication. After you’re married, you may need to change some of your insurance policies or cancel something if you and your spouse choose to combine health care plans or something similar. Make sure you have the proper insurance for your home, cars, etc., and you might even want to change your spouse to the beneficiary on your life insurance policy. Also make sure you have a living will, and a health care (POA) power of attorney. These things are not fun to do, but they are necessary financial housekeeping tasks for newlyweds. Since your household size officially increases once you are married, you might want to consider increasing your emergency fund amount or your other savings accounts. Sit down together and discuss how much money you both feel comfortable with having in your savings account. Write out a bare bones budget, consider how much debt you have, and think about how much you would truly need to get by if one or both of you were out of work. Then, put a deadline in place and start setting aside extra money to boost your savings. If you decided earlier when you were engaged to save for a large expense like a home, a big vacation, or even a baby, come up with a mutual plan to specify how much you need to set aside per month and where you will house your savings. 4. How Will You Handle a Budget Slip Up? So you most likely have your desired monthly budget in place. But have you decided how you will approach the situation if one of you overspends or if you have a lot of unexpected expenses in a given month? While discussing growing your savings is a good thing, some couples forget to specify which situations they believe would prompt them to withdraw from their savings account. It’s unrealistic to think that your finances will flow perfectly each month, so make sure you prepare to deal with the results of mismanaging money in your marriage. Also, make sure you are both clear about what qualifies as an emergency. For us, we mutually decided not to touch our emergency fund unless one of us lost our jobs and we needed to pay rent or purchase food. We decided to prepare for known annual expenses (like car repairs and maintenance) ahead of time and come up with a cash buffer to sit in our checking account in case expenses are higher during one month. In the worst case scenario, if one of us bombed our budget, we’d have to accept our mistake and commit to not letting it happen again. Maybe you’ve spoken about your 5-year plan before getting married, but be sure you discuss your goals and aspirations for later down the line as well. Odds are, your future goals and vision for your life together will involve money. What kind of career path are you both heading toward? How would you like to see your income increase in the following years? When do you want to retire? If you have kids, would you like to help them through college? Do you prefer to take a vacation every year or will you have other priorities? These are all topics of discussion that will come up in your marriage at one time or another. Why not talk about it now as you are starting your life together? This helps set realistic expectations and avoid money fights later down the line. Remember to keep an open mind and be willing to compromise when going over financial topics with your partner. It may seem overwhelming at first, but you married your spouse for a reason and should hear them out and value their opinion no matter what. Have you discussed these financial topics with your partner or spouse yet? What other topics of discussion would you include?